The best brands of nasal strips for sleep apnea. Before you find out about how nasal strips can help your sleep apnea, you should first learn about what nasal strips are. Nasal strips are simple sticky strips that are placed on the lower area of the nose, usually right above the nostrils. The strips have a flexible body that tugs gently at the nostril area, dilating them and allowing more air to pass into the nose. This is basically how nasal strips help improve snoring and sleep apnea. By allowing more air to pass into the nose and subsequently the lungs, breathing is easier and more consistent. Nasal strips are also effective for a better night’s sleep when a person is suffering from nasal congestion or in simple terms, a stuffy nose. Can Nasal Strips Cure Sleep Apnea? The answer to this is “maybe”. For mild cases of obstructive sleep apnea or snoring that are mostly caused by nasal congestion, a deviated septum, or nostril collapse, nasal strips may be able to drastically reduce the number of apneas experienced as the nasal airway will be opened up. However, for more severe cases they may only help the patient breathe more comfortably without doing much for their sleep apnea. Obstructive sleep apnea and snoring caused by obstruction of the throat (which is more common among patients) will likely not be alleviated by use of nasal strips since the obstruction is not removed in any way. However, those who use a CPAP machine may find that using nasal strips in combination with the CPAP makes it a bit more comfortable to breathe through the nose with the machine on. There have been a number of studies done on the effect of nasal strips on snoring (which is often the ailment nasal strips are marketed for), but very few on their effects on sleep apnea. In one study done on 50 participants (30 of which had obstructive sleep apnea), it was found that nasal strips did nothing to alleviate sleep apnea, though some participants reported better quality of sleep and 10% felt that their daytime sleepiness level had reduced. Another study aimed at studying the effects of snoring found that nasal strip did little to help snorers if the reason they snore is because of sleep apnea. This comes to show that in most cases, nasal strips probably don’t offer much help to patients with sleep apnea. That being said, there was one study in which 19 out of 26 patients of obstructive sleep apnea and snoring had an improvement in their respiratory disturbance index reading after using nasal strips during their sleep study. The participants that benefited from the use of nasal strips in the study were mostly patients that suffered from nasal congestion or a deviated septum, and those that had no or minor obstruction of the throat. This tells us that if your sleep apnea is caused by nasal issues and not those of the throat, nasal strips could have a place in treating your condition. There are several generic brands of nasal strips in the market, but most of the market of nasal strips is dominated by Breathe Right. Therefore, the only recommendable brand at the moment is this particular brand of nasal strips. Each product has different features, and the last product is targeted toward children. What they do have in common is the fact that they are drug-free and function the same way to open up the nasal airway. The Breathe Right Menthol strips are still drug-free; this product only additionally has microscopic beads of mentholated vapor that break and release the vapor when the user scratches the strip. The mentholated vapors provide additional relief for those who have a congested nose. Do note though, that Breathe Right products are sealed with natural latex and are therefore not suitable for use by those who are allergic to this material. In a nutshell, using nasal strips may not cure sleep apnea unless it is mild and caused mainly by nasal issues. However, they can make sleeping at night more comfortable since it will be much easier to breathe through your nose, even while using a CPAP machine. 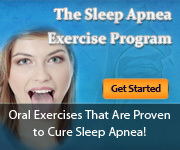 Sufferers of mild obstructive sleep apnea can try nasal strips and see if it helps with their apnea, but other patients should only use it as a form of treatment for sleep apnea in combination with other proven treatments like the CPAP machine or mouthpieces.